The Poetry Style of Kay Ryan. Comments by J. Zimmerman. Poets: A.E. Housman. Adam Zagajewski. Agha Shahid Ali. Amy Clampitt. Billy Collins. Billy Collins exercise. Snorri's Edda. Carl Dennis. Corey Marks. Her best book, as of its publication in 2000.
as she changes from publishing tremendously good work to great work. Notice and admire the contents: how "Say Uncle" teeter-totters between on the one hand being an acceptance and a giving up while on the other hand being a celebration of hanging on even in the face of great difficulty. While this poem applies to any difficult decision or relationship, it's also a poem about the difficulty of being a poet or artist. Notice and admire the form: the brevity (small number of very short lines), the inner rhymes and slant rhymes, the wit, the surprises. Her poems subtly and wittily comment on the human condition. They are rooted in emotion rather than autobiography, opening them to wide application, interpretation, and relevance. They work at different levels, engendering both a visceral and an analytic response, providing a full-brain (left and right brains) experience. They provide a full-body experience: the best of her poems give me chills or make me laugh aloud or both. They amazement and delight the reader, being about what amazes and delights the poet. Compact. A few short lines; often a single stanza. Music of rhythm e.g. 2 stresses per line. Music of rhyme: KR's rhymes (mainly internal and slant) are delicious, surprising, and delightful. Use of opposites: e.g. a poem about "Blandure" is implicitly a comment on "Grandure". Kay Ryan's witty poems are bracing distillations of her precise observations of the world and the vagaries of humankind. Aside from the shardlike fragments of Sappho or the sharpest of haiku, it is unusual to find such compression of thought and deftness of touch as are typical of her minimalist art ... fine craftsmanship and subtly subversive tendencies. It takes genius to pare the redundancies from one's writing, to have that sense of the essential and to resist embellishment. I think it also takes a bit of bravery, as a poet, to say "that's it: it's all there, in that small bundle". Kay Ryan's magnificently compressed poems shimmer exuberantly not only with joy and intelligence but also with genuine wisdom. Few poems of today will last through the sieves of time for 500 years and far fewer for a millennium or two. Every generation is a "Now" generation. Technology changes are lossy. Very little will survive from our times. But it's not just the occasional epics (Iliad, Gilgamesh, Beowulf, ...) that survive. 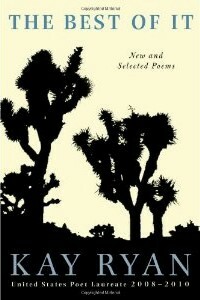 It's also (after Parisi) "the shardlike fragments of Sappho or the sharpest of haiku" — the category of KR's best poems. We're transitioning from the printing-press age that began in the 15th century with Gutenberg. Possibly moving to video dominance and a rejuvenated oral tradition — and the re-ascension of rhymed poetry. The intellectual aspect of KR's poems will be a delight to far-future MFA students puzzling out her meaning in quaint long-ago 21st-century English. I read the noble dead: Donne, Hopkins, Larkin, Housman.